I recently made a solar powered GMRS repeater for use on a remote farm. The largest building on the property is the barn and so this was chosen as the home for the machine. So this is the almost finished repeater mounted onto the wall of the barn. There are still a few jobs to complete such as running the antenna coax and mounting the solar panel outside. We ran out of time before the summer storms came and we had to go home. Luckily we'll be back there shortly so can finish it up. 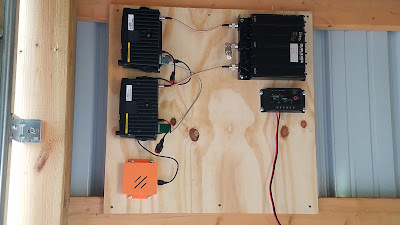 It's a simple setup consisting of 2 UHF Motorola SM50's, a "mobile" cavity filter, Raspberry Pi 3 running SVXLink repeater software, solar charge controller, 35 Amp lawn mower battery and various wires and connectors. Oh, and a solar panel and antenna. Total cost for this machine was about $325. What size panel are you using to power it. Is it pan tilt?